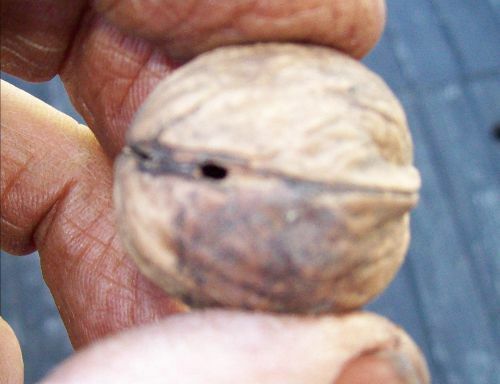 Covered in this blogletter is our continuing battle with Phytophthora, and the latest results in our search for better walnut varieties. Plus I have thrown in a few notes on random walnut topics spotted on the internet. This letter also includes snippets of conversations, edited for brevity, that I have not had room to include before. Thank you again – it is always good to hear that things have gone well for one when for us it has been a very difficult season – there is still hope there at the end of the tunnel! We were frosted again this season – after a 4.6 degree average increase in July temperatures and warm spring the trees were all set for an early start to the season when hit by severe frosts during the last week of Oct/first week of Nov – diary notes from last year confirmed that the trees were at exactly the same stage of leaf burst and male tassel exposure as when we were hit in 2013 ….. With exactly the same results! Grrr! After 25 years of getting trees to this stage it would be nice to get the crop! At least we learnt a little from last years experience and I was out with compost tea sprays each morning to the walnut trees post the frosts and we managed to maintain the trees in a much better state of health and have foliage return much earlier than the previous year – so hopefully ……. Recommendations out of all of this would be for our area to select cultivars which are very late leafing out – we have found that our G26 and Franquette cultivars were not affected this year and cropped well. 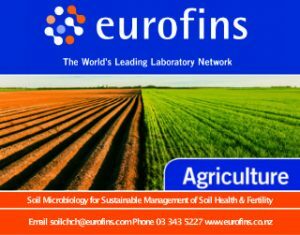 We have also found that choosing a good cultivar for root stock and ensuring it is really vigorous is of utmost importance. Good cultivar trees on poor root stock will not “recover” and make up growth …….like us you could be pulling them out as hopeless 15-20 years later!!!! A general comment re the use of compost teas – I have observed significant increase in foliage size and depth of colour following the use of the teas and we also had an increase in weight of nut yield/tree (2012) with a larger proportion of nuts being in the bigger size gradings ……. Of course it would have been nice to have verified this through crops in the last two years! There is always more than one variable in farm management so I cannot yet say it is the compost teas that has led to this change. We still have a very low technology approach to nut drying – with a household log burner in a concrete bunker with fans and an expelair to remove moist air – the nuts are placed in a single layer suing stacks of bread crates. A bit of handling but it is all “woman’s sized” and manageable – and surprisingly efficient in terms of throughput and rotation. I will shift the nut grader into this area so that I have the larger nuts on their own trays and can leave them the extra couple of days to finish off the drying. Otto’s harvester works well – but we planted with this form of mechanical harvesting in mind. (It really needs level ground, appropriate spacing and pruning). He is keen now to have a business develop the prototype and make it available commercially as this is beyond our current resources. Interested parties can contact Otto. The beauty of the harvester is that ripe nuts are collected direct to bins – so there is no washing required and not the daily collection of nuts from the ground is largely avoided. I am hesitant to mention this (as I will probably be hiding over the Nevis on the day!) ….. But if any walnut growers out there are interested in our harvest and shelling processes the Country Calendar team visited at this stage. I have been told the programme will probably go to air on the 21st of June. They were a great team and I am sure they will make the most of it – had thought the focus was going to be more on Otto and his mechanical inventions ….. But the timing was not good as he went off to the Treecrops Conference and came back to the second day of filming pretty tired to two very cold days! 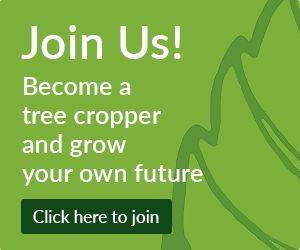 There may be something there of interest to some growers. I got your email from the report on the Walnut trial in The Tree Cropper journal. I am looking for yields of nut crops in NZ per hectare (and overseas yield data also) to compare nut cropping with other farming systems. I am making a case for tree based land use as a sustainable shift in NZ agriculture. I sent him the trial results in a bit more detail. The trees were planted at 10 metre spacings. At this age they would have yielded the same per tree if they had been planted at 5 metre spacings or closer. So for Shannon with 13.6 kg of nuts per tree in 2013 at age 15 would have equated to 1.36 t/ha at 10 metre spacing, and 5.4 t/ha at 5 metre spacing. Rex at 8.6 kg per tree would equate to 860 kg/ha at 10 metre spacings, and 3.4 t/ha at 5 metres. You are right to concentrate on yields per hectare. It is the single most important factor holding back walnut cropping in NZ. Our mature stand of unselected seedlings is only giving 1200kg/ha, while our best crop has been 2.5 t/ha for 16 year old ‘Roadside 12’ trees. 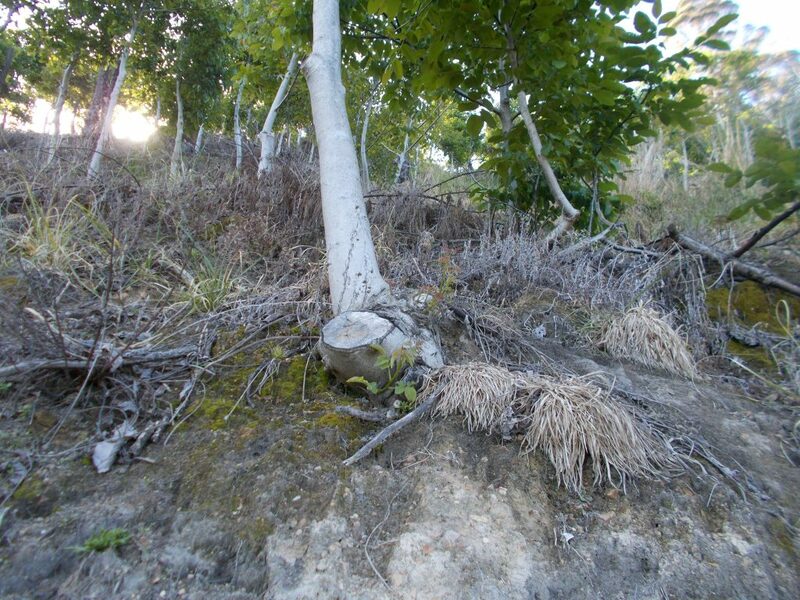 A limited number of Well-grown Three-year-old Walnut Trees of the above variety for sale. Apply to C. H., c/- Waikato Times Office, Hamilton. Wonder if they were Franquette? Many thanks for latest blogletter (16). So interesting to hear about walnut growing in China and Jeffreys account of his visit there. Following on about the variety of timber colours in locally grown trees, I was wondering about the cause. The heartwood in them seems to vary from very dark, almost black, grain through to really pale. Different soil with the different locations? They all looked like Regia, but different varieties? I’ve had a Black walnut tree too ( Nigra) and that had the usual purpley / brown heartwood, similar to the imported stuff from the USA. As you may know, my whole project is about growing J.regia for timber (+the nuts). You are asking the same questions I am. Firstly, about the heartwood. I wish I knew what caused the colour. We thin to waste regularly, and I have yet to find a tree with any coloured heartwood. I am hoping that that is just an age thing. A couple of months ago we cut 2 trees up for sawntimber. I wasn’t surprised that there was no dark heartwood, though the trees were 35 years old with a dbh of about 35cms. If you are using walnut timber from different sources, maybe you are in quite a good position to take note of the environment of the tree and compare it to the colour? The other problem with pruning walnut trees is that they tear badly. So I do a 2-cut approach if the branch is more than a couple of centimetres thick. The article at the Walnut Symposium about growing walnuts for timber in Spain will be interesting. You should be able to read it on the net before long, as that is what happened to previous symposia. Thanks for your advice and comments. Much appreciated. I will try and take more note of tree environment in relation to it’s timber colour. However, I have to say, that from one avenue of walnut trees near here, that were quite old and decrepit, there was a big variety of colour difference, and yet the trees looked similar. I agree you get very little heartwood showing in young trees. Even a 50 year old tree I had some years ago was only about 100mm heartwood. I fear I’ve missed the boat with pruning this year, and will remember to do it in the autumn. There are one or two I’d like to try and train for a future timber tree . Most, I don’t mind branching out and producing nuts! Will look forward to the report on the Spanish experience on timber production. Australia’s only large-scale commercial supplier of walnuts has ended nut processing in Vietnam. All of the nuts grown by Walnuts Australia at Tabbita and Leeton in southern NSW and at Swansea on Tasmania’s East Coast are being shelled, graded and packaged in the Riverina. Operations manager Derek Goullet say its new $11 million processing plant at Leeton is designed to mimic a hand-cracked product. The company is now supplying walnuts to Woolworths for its Select brand and expects to pick up new export markets for its Australian processed product. The new cracking plant is also expected to reduce the cost of production and limit exposure to foreign exchange rates. 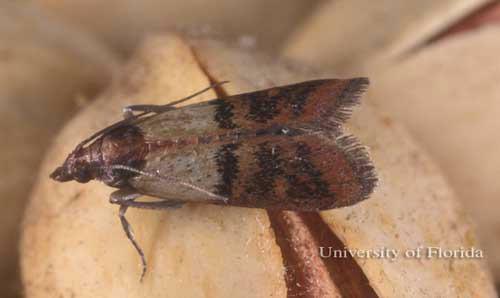 Following on from the mention of codlin moth last time, it has been brought to my attention that some people may be confusing it with the food storage moth. They are quite different insects. 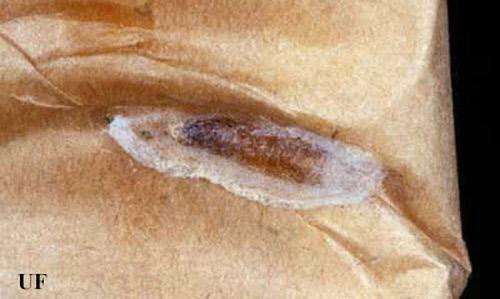 The food storage moth, also called the pantry moth, is called the Indianmeal moth in America because it was a major problem for the American Indians’ corn storage. 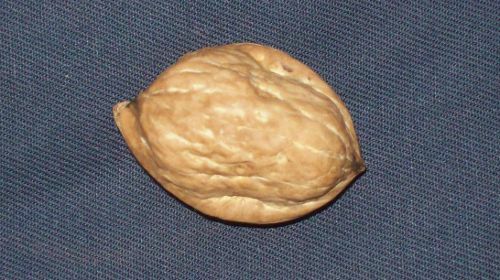 It can be quite a problem for walnut growers, possibly worse than rats. Processors have to be vigilant, and growers who only sell nuts in shell can get caught out as well. And it is sometimes hard to tell if a nut has been infested until you open it. Larvae: There are five to seven larval instars. Their color is usually off-white, but has been observed to be pink, brown or almost greenish, depending on the food source. The mature larvae are about 1/2 inch in length. They have five pairs of well developed prolegs that help them move considerable distances to pupate. Pupae: The larvae pupate either in a silken cocoon or unprotected. The pupae are 1/4 to 2/5 inch long (6 to 11 mm) and are pale brown in color. Pupation takes place away from the infested material. In fact, the late instar larvae can travel such distances that they are often mistaken for clothing pests. Within the pantry the small larvae often climb to other shelves before pupating. This misleads people trying to find the source of the infestation. I have found that good hygiene is paramount. The pupae shown in the picture seem to last quite a long time in unobtrusive places only to re-emerge and infect the new crop. 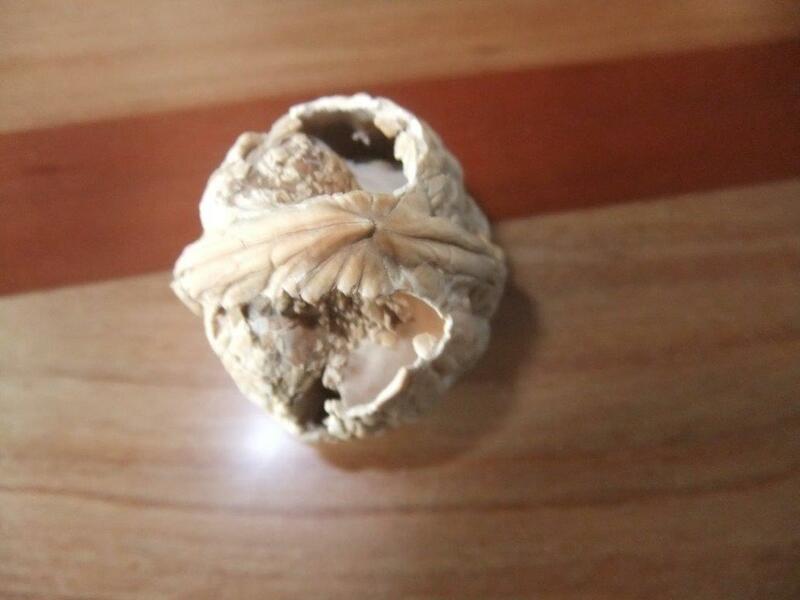 Our aim is to make sure there are no in-shell nuts in any buildings by the end of January. Our personal supplies, to last us over till the next crop, are all cracked and put in the deep freeze. We even do a complete clean out to make sure there are no nuts or broken pieces in corners or behind the driers. I read somewhere that all stages of this insect including the eggs are killed if deep frozen for 4 days. That was put to the test one day when they got out of control at my mum’s place. So we disposed of the obviously infested products, threw all her flour, seeds, spices and other dry goods into the deep freeze, and wiped down all the walls, shelves etc. to get rid of the pupae. It worked a treat. There does seem to be difference between varieties as to how susceptible they are to infestation. Tight sealed nuts are moderately impervious. Wilson Wonder can have a weak spot at the stalk end, and the new variety Gaudion seems to have a problem too. Now let us hear how you deal with this troublesome pest.